What if everything you thought you knew about protein consumption on a ketogenic diet was wrong? What if the secret to weight loss on a keto diet isn’t actually fat, but protein? While it’s easy to see why healthy fats are the stars on a ketogenic diet, many keto experts recommend way too little protein to support lean mass and recovery. And your body uses protein for way more than just muscle building. Read on to find out how you can lose more weight, improve body composition, and keep your blood sugar balanced — all while increasing your protein intake. There are over 10,000 different proteins in your body — from your bones, muscles and connective tissues to your hair, skin, nails and lining of your GI tract and blood vessels[*]. When your body digests protein, it gets broken down into molecules called amino acids, some of which are essential amino acids your body needs but can’t produce on its own. Your body can’t store protein in the same way it stores carbs and fat, so you need to make sure you’re eating the right amount of protein every day (more on this later!). Protein helps you feel full. Protein is super nutrient dense, satiating, and takes a while to digest. This helps when you’re trying to curb hunger and lose weight without starving yourself. Protein also builds muscle, which burns calories even when you’re not working out. It will be easier for you to create a calorie deficit and lose stubborn fat with more muscle mass on your side[*]. Plus, when you start building muscle and shedding fat, you may not weigh less, but your body composition will change for the better. You’ll start to look toned instead of flabby the more you work out and refuel with protein. Protein is essential for recovery after your workouts because every time you tear your muscles at the gym, you need protein to build them back up bigger and stronger. So knowing protein’s stellar resume, why would having too much on keto be a bad thing? Yes, gluconeogenesis is a metabolic mechanism where your liver and kidneys make glucose from non-carbohydrate sources like protein. No, you don’t have to worry about protein kicking you out of ketosis. Your body needs to maintain a certain blood sugar level at all times, whether you’re in ketosis or not. However, your body is totally capable of making the small amount of glucose it needs to function without you scarfing down 15 cookies to give it that sugar. When you cut carbs and sugar from your diet via a ketogenic diet or intermittent fasting, your body panics and looks for glucose everywhere. First, it will deplete your glycogen (glucose) stores because they’re the easiest backup source. But then your body (specifically, your liver) can actually turn to other non-glucose energy sources to create the glucose it wants (since you’re not providing it via your diet). That process is called gluconeogenesis, and it’s not as intimidating as it sounds. Gluconeogenesis literally means to create new glucose. Why does gluconeogenesis (GNG) even exist? Your body actually needs some glucose to function. So, even though you’re intentionally limiting carbs on a keto diet, your body’s first instinct is to protect you from glucose starvation. Think of gluconeogenesis as your body’s backup source of glucose. And it happens when your body forms glucose from protein when it doesn’t have enough carbs. The common worry among keto dieters is that if you cut carbs and eat too much protein, you may run the risk of that protein turning to sugar and raising your blood sugar levels. 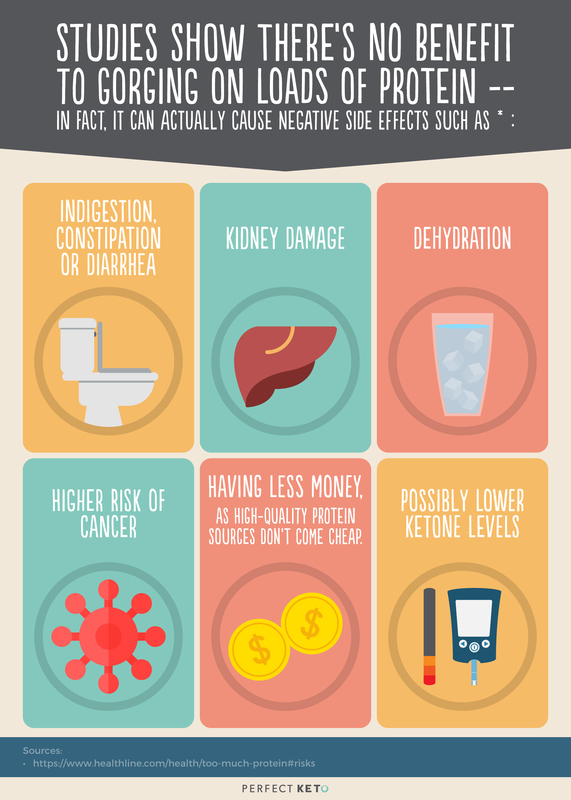 Theoretically, you could even raise your blood glucose enough to kick you out of ketosis. Does overeating protein really affect your ability to get into ketosis? How much protein is too much? Read on to find out. Studies show that digesting protein stimulates the production of glucagon, a hormone that helps break down glycogen to glucose in your liver. This means protein should increase the chances of GNG happening when you’re low-carb[*]. However, your body also sends out insulin to handle all that glucose, so it actually nets out and doesn’t really matter to the average person[*]. And there’s also some evidence that gluconeogenesis liberates glucose so slowly, it would be tough to experience high blood sugar after just one high-protein meal[*]. Unless you’re an insulin-dependent diabetic or struggle with insulin resistance or insulin sensitivity issues, protein shouldn’t affect your blood sugar levels. To test the theory that half of dietary protein becomes glucose, scientists in one trial gave participants 160g of protein (that’s a lot) and expected to see 80g of glucose produced in return[*]. They measured blood sugar levels after the participants ate lean beef, egg whites, and even casein, but the effect on blood glucose (BG) levels was still the same: nil. Researchers in this final study wanted to know how protein intake contributed to the body’s own glucose production[*]. So they had participants fast overnight and then eat a protein-rich meal without carbs the following day. The scientists laced the protein source, which in this case was eggs, with a tracking substance so they could watch it throughout the digestion process. The black dots represent the participants’ normal blood sugar levels during the eight hours after they ate. The open white circles show the effect of the tracked protein source (i.e., the special eggs) on the participants’ blood sugar levels during that same window of time. 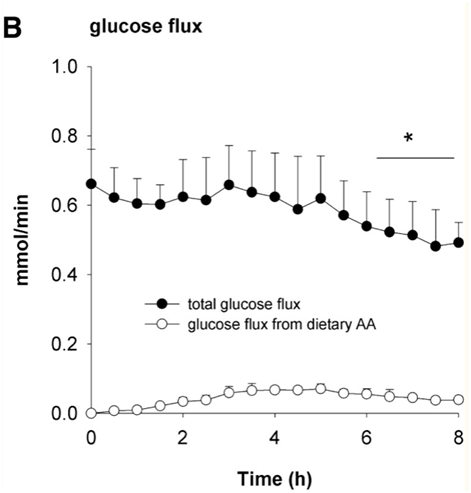 This graph reveals that dietary protein contributed very little to overall glucose production — even when they created ideal conditions for gluconeogenesis to occur. This study used two parts: an overnight fast and a protein-rich meal. So how does fasting alone contribute to GNG? Fast overnight and studies say half of all glucose released into your bloodstream is the result of GNG[*]. Yet five participants following a keto diet for 11 days only noticed a small increase in glucose production from GNG after overnight fasting. This 14% increase was equal to a rise in blood sugar of less than 1 gram of glucose per hour[*]. So what does all this teach us? 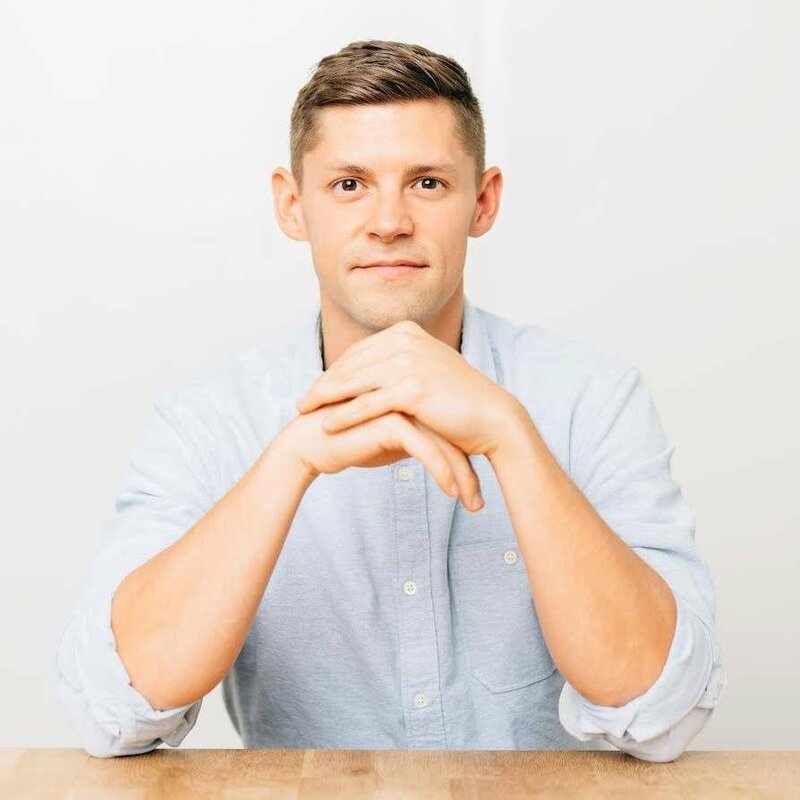 In the same way, you can’t gorge on fat and claim to be in ketosis; you don’t just splurge on protein and find yourself kicked out of ketosis because of GNG. Gluconeogenesis is a slow, steady process with a fixed rate. A rise in blood sugar after you eat a protein-rich meal doesn’t automatically signal GNG as it generally takes longer for your body to liberate glucose from protein. Any rise in your blood glucose levels is most likely due to your liver releasing hormones to digest that protein. One of the most important facts to remember is that GNG doesn’t happen because it can; GNG only happens when it needs to. Studies show having more protein in your diet doesn’t increase the rate at which GNG occurs[*]. If GNG was a supply-driven process, an excess of protein would trigger the start of it. But just because your body has too many amino acids doesn’t mean they’ll actually get converted to glucose. If your body doesn’t need this glucose, your body won’t search for it or create it from something else. Speaking of which, gluconeogenesis can also happen with fat — not just protein. Lactate and glycerol, which your body breaks down from triglycerides (stored fat) and glycogen (stored carbs) when there’s not enough dietary glucose. Glutamine and alanine, amino acids found in the proteins throughout your body, are also preferred sources for GNG when carbs are low. Your kidneys like glutamine, but your liver goes for alanine[*]. In reality, the process of GNG is incredibly rare when you’re speaking about healthy bodies under normal conditions. But don’t brush it off just yet. There’s a very small window of time when gluconeogenesis may actually be a problem. A ketogenic diet trains your body to use fat for energy instead of glucose. But it can take your body up to three weeks to reach ketosis. It’s during this transition (before you get into ketosis) that your body is more likely to turn amino acids into glucose. It generally takes between 18–72 hours for your body to use up all its glycogen stores. When there’s no more, free-floating amino acids will be your body’s go-to fuel source. At this point, your body is used to running off of glucose and isn’t very efficient at burning ketones. Because of this, your body may turn to protein and fat for glucose a little more than when you’re completely fat-adapted. So the first three weeks of your keto journey are when you’re the most vulnerable for GNG. Eventually, your body will figure out that protein and amino acids are a terrible long-term fuel source via GNG, and that ketones are a way more efficient energy source. Again, just because protein can turn into glucose doesn’t mean it will. When your body needs glucose, it will make whatever small amount it needs. Once the need for glucose lessens and your body realizes how awesome it is running on fat, GNG also decreases. But eating an adequate amount of protein is the key to making it to ketosis for this to happen. If you don’t eat enough, your body could start converting your muscle mass protein to glucose. And this does major damage to more than just your gym selfies. Are You Eating Enough Protein On Keto? It’s true: you might experience some gluconeogenesis when you’re just starting out on a keto diet. But it will happen on a much lesser (and as-needed) scale once you’re fat-adapted. It’s much more likely that you’re not eating enough protein on a ketogenic diet. And this common mistake could sabotage your energy and weight-loss goals. The thing is, you may not even realize you’re eating too little protein. That’s because when you’re switching to keto, you’re eating more satiating fat and your cravings are diminishing. That’s why it’s important to calculate your ideal protein intake and make sure you’re getting enough of it to support your goals and activity level. Feeling weak and tired all the time. Being plagued by brain fog despite adding MCT oil to your keto coffee. Suffering from thinning hair, peeling skin and weak, brittle nails. Always feeling hungry and constantly craving sweets thanks to the lack of satiating protein in your diet. Gaining weight or being unable to lose weight because you have more body fat than fat-burning muscle. Being sick often since you have less protein producing antibodies to protect you. Swollen legs, ankles, and feet caused by fluid buildup in your tissues which should be transported via your blood vessels with protein’s help. Losing muscle mass, which also slows your metabolism, so you burn fewer calories at rest and turns your body from solid to soggy. Now, let’s be clear: If you’re losing weight, have better cognitive performance and more physical energy on keto, your protein intake may be spot on. But if you’re experiencing any of those symptoms or feel as if keto should be working better, you may want to start experimenting with your protein intake. If you’ve been following macros that start with fat instead of protein — or rely on general percentages instead of your body’s specific needs — that’s the first change you’ll want to make today. These percentages were calculated for a therapeutic keto diet designed for epileptic patients. It might work for some people, but most healthy adults need more protein. If you want to lose weight and build or maintain muscle, you need to prioritize your protein levels first. Start with how many grams of protein your body needs just to perform its daily functions. You can figure that out with this keto calculator. After you figure out your ideal protein intake, then it’s time to determine your carbs. The typical range is 25-50g of carbs per day in keto, depending on your unique needs. The final piece of the puzzle should be fat. You’ll need to figure out how much fat you’re allowed to eat on keto to reach your goals (i.e., weight loss versus maintenance). When you can’t have too many carbs, many people think eating more dietary fat is the answer. But if you’re not losing weight immediately, you may be eating too much fat. When you load up on dietary fat, your body will prioritize burning that — not your fat stores, i.e., body fat. So if weight loss is your goal and you have a substantial amount of body fat, you don’t need to add tons of dietary fat to the menu. That means getting adequate protein before you start drowning everything in grass-fed butter and olive oil. Protein is a dieter’s secret weapon since it helps you eat fewer calories and builds more fat- and calorie-burning muscle. Here’s how to figure out your optimal daily protein intake the easy way. Protein intake isn’t a one-size-fits-all number. To use this method, you’ll need to determine your body fat percentage first. You can estimate your body fat percentage based on pictures or calculate it using this formula. Once you have your body fat percentage, you’ll need to find out your lean body mass (LBM). Take your total weight minus your body fat to get your lean body mass. So if you weigh 200 pounds, for example, and you have 30% body fat, your LBM is around 140 pounds. If you’re not sure exactly where you fall, you can always determine your ideal protein intake range to experiment. So using our example, take your LBM (140 pounds) and multiply it by 0.6 to get your minimum protein amount (140 x 0.6 = 84g). Do the same for your maximum protein intake (140 x 1.0 = 140g). The ideal intake range, in this case, would be between 84–140g of protein per day. Simply split up this amount throughout your day between keto meals and snacks to make sure you’re getting a steady supply instead of protein loading all at once. Remember to stick to the high end of your protein intake range during your most strenuous days and the low end for less active ones. The second way to figure out your recommended daily protein also happens to be the fastest. If all that math seems like a pain, you can always plug in your numbers to this Keto Macro Calculator. You’ll have your protein macro in less than a minute. You’ll also score your recommended carb intake and daily calorie goals. Keep recalculating your macros and adjusting them as you lose weight, gain muscle and get further into ketosis and fat adaptation. You don’t need carbs to build muscle, but you may need more muscle-building protein than what a standard ketogenic diet offers. In this case, you may want to try a High-Protein Ketogenic Diet, which some daily lifters swear by. Since we’re all about using accurate numbers to find your protein intake first, bodybuilders may be able to up their multiplying factor to between 1.2 and 2.0 when they’re in ketosis. So going back to our example, that 200-pound person with 140 pounds of LBM can eat between 168–280g of protein each day if they’re working out a ton and want to pack on more muscle mass. Even though you shouldn’t be scared of GNG, you also shouldn’t eat more protein than your body needs either. You may find that your blood ketone levels go down when you eat a lot of protein, but that doesn’t mean you’re not in ketosis or that you’re not losing weight. Don’t undereat protein just to keep your ketone levels in the “optimal” range. Ketones don’t cause fat loss; they just indicate your body’s actively breaking down your fatty acids and may be on its way to ketosis (or already there). You can have high ketone levels and still not lose an inch of body fat or gain an ounce of lean muscle. The best way to see how your body responds to protein is to act like a scientist and observe yourself. First, use the macro calculator above or do the math to find your ideal protein range. Then, track your food intake and watch your ketone levels after eating different serving sizes of protein. Also, keep note of your energy and performance levels at the gym. Gluconeogenesis might be a problem if you’re pounding protein shakes, eating steaks for every meal and skipping the gym. But for the average keto dieter who only goes over their protein macro by 5–15g, GNG is nothing to worry about after your adaptation phase. Since protein is so important for the health of your body and your weight loss goals, let’s wrap up with the best keto-approved protein sources. A typical serving of protein will be between 4-6 oz. for women and 8 oz. for men. Watch out for certain processed meats, high-sugar protein bars, and questionable protein powder sources. Many of these contain artificial ingredients, added sugars, and other hidden carbs. Anyone on a ketogenic diet knows the health benefits of good fats. But it’s time to recognize protein for the powerful macro it is. If you’re into keto for fat-burning and muscle maintenance, you might want to rethink how much protein you’re eating. 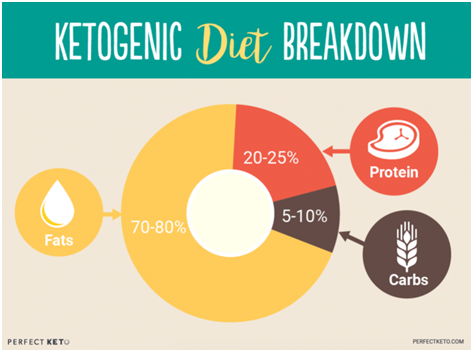 It’s not accurate to think that gluconeogenesis is the result of excess of protein when you’re eating keto. There’s no evidence to suggest that protein on keto immediately turns to glucose, yet there’s tons of literature on how beneficial protein is for curbing your appetite and toning up your flab. So determine your ideal protein intake using math or the Perfect Keto Macro Calculator right now. Then add a few protein-rich keto recipes to your keto menu planning to make sure you’re meeting your daily intake amount. Sneak in 30 minutes of exercise on top of this and you’ll be one giant step closer to reaching ketosis and getting all the benefits from keto that everyone’s talking about.